Stacy Yates Nutrition: Food Fact Friday: EVOO! Have you ever wondered which oil is the best to cook with? This is a question that I often get asked. 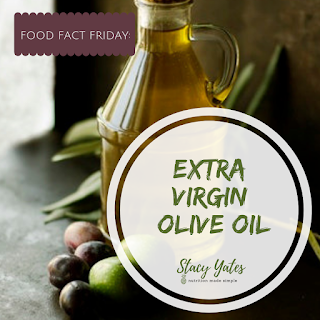 Well today, we’re going to talk about the health benefits of Extra Virgin Olive Oil, which actually is one of the best and most versatile oils you can cook with! So what makes EVOO so good? For one, olive oil is very high in polyphenols. These polyphenols have antioxidant properties – which help protect your cells from free radical damage. (They also act as a great prebiotic for your gut microbiome). Olive oil is also known to have benefits for brain and heart health, and has anti-inflammatory properties (from oleocanthal’s). EVOO is also high in monounsaturated fatty acids – which aren’t as sensitive to heat as polyunsaturated fatty acids. You want to cook with fats that have oxidative stability. James Dinicolantonio, Pharm. D. is an internationally respected cardiovascular research scientist, who has spent nearly a decade studying the effects of different fats on the body. His years of research confirm that EVOO is simply one of the best oils to cook with – even better than coconut or avocado – which are known for their high smoke points. Dr. DiNicolantonio says that EVOO is not only safe, it is beneficial as it dramatically reduces advanced glycation and other harmful substances from forming. During next week’s Try This Tuesday, I’ll talk about how to buy a good olive oil! Did you know? There’s a tremendous amount of “Olive Oil Fraud” out there, and the health benefits I just mentioned will only be realized if the olive oil you are using is high quality and pure. Did you know? EVOO is also a source of Vitamin K and Vitamin E.
Want more information on EVOO?